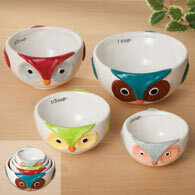 Dimensional glazed ceramic owl measuring spoons will be a charming and useful addition to your kitchen. Our adorable measuring spoons come with a removable chain to easily store them together. Each owl design features a different color indicating a different measurement. Includes 1 tbsp., 1 tea., 1/2 tea. and 1/4 tea. Set of four. Measuring spoons coordinate beautifully with our owl measuring cups.